Use Offcloud to convert any webpage to a clean PDF file. Having a webpage converted to a PDF file is a neat and useful feature. But having to resort to a special online tool just for converting webpages to PDF is hardly convenient. With Offcloud, you don’t need any third party plugins or web services. Offcloud enables you to instantly save any web content you find interesting, such as a blog article or an online shop item, and convert it to a well-formatted PDF document that you can read with any e-book or PDF reader. Offcloud lets you grab the most important information from the web and turn it into a structured and portable output file. You can use Offcloud’s PDF functionality to remotely upload the newly created PDF files to your favorite cloud storage solution or store it on Offcloud. To use Offcloud’s PDF conversion, you don’t need any setup. Just copy the page link you would like to convert and paste it into Offcloud. Then, choose Convert to PDF and you will have your well-formatted PDF document in no time. 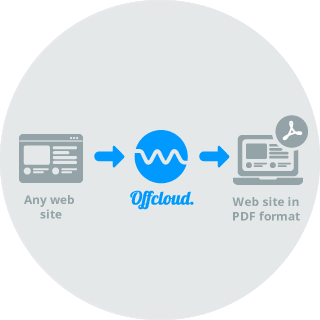 You can use Offcloud to convert webpages to PDF for FREE. With a free account, you can convert up to 3 links. Then, you can enjoy the services without any restrictions for just $9.99.